Yellowstone National Park is a treasure and an amazing experience for families, that may just bebetter in winter. Seeing as the park is famous for its thermal features like geysers, the interaction of this heat and cold winter weather creates unique and stunning effects. Smaller geothermal features have enhanced visibility, while the always exciting geysers can exhibit the exciting phenomenon of instantaneous ice rain as geyser eruptions come out hot, then freeze in midair. It is also a particularly exciting time to see native wildlife, as the quieter nature of the season makes spotting them earlier, not to mention the marvel of snowshoe hares turning white and the snow beards on bison that will delight children. It is an especially great time for families to visit, as winter fixtures like rides in historic Bombardier Snow Coaches make for incredible afternoons; as do guided snowshoe and snowmobile expeditions, nature walks and photo tours. Conscious of the difficulty of navigating during the winter, increased and snow-friendly shuttles are offered by the park to carry you to the most famous geysers and photo spots. All this results in winter actually becoming an easier time to hop around the park while avoiding crowds. Be sure to check the operating hours and seasons to see what is available and what isn’t, as well as updates on current weather and possible closures. There is still some available camping and a host of activities to enjoy. If you’d like to learn more, visit Yellowstone’s Official Site. 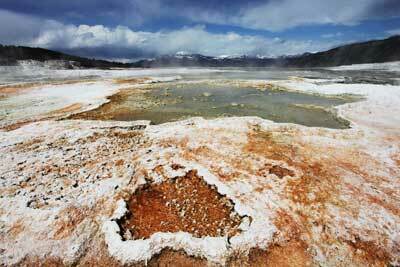 Also check out or great Yellowstone Itinerary! Interested in booking or planning a vacation to Yellowstone right now? Check out some of the offers currently available for airfare and hotels at Kayak, Orbitz and Priceline. See more lodging options at Hotels.com and Hilton. Get started on your next trip today!